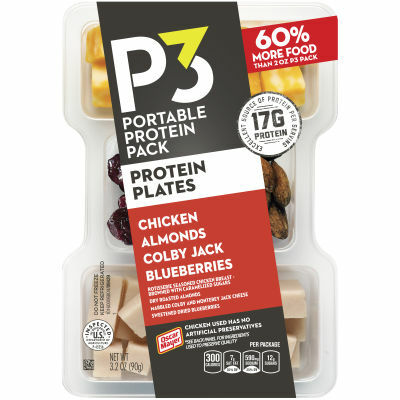 P3 Portable Protein Pack, Protein Plates, with 60% more food than 2oz packs. Rotisserie Seasoned Chicken, Dry Roasted Almonds, Marbled Colby and Monterey Jack Cheese, Sweetened Dried Blueberries. Get your hands on the more interesting way to get your protein with P3 Protein Plates, 17G of protein in every pack.